These days the supermarkets have so many lovely varieties of hot cross buns on offer for Easter but there is something so special about making your own at home and filling the kitchen with the beautiful aroma of fruity sweet buns that the whole family can’t wait to dive into. They are actually quite simple to make especially if you own a mixer with a dough hook and can be made over 2 days if time is an issue. 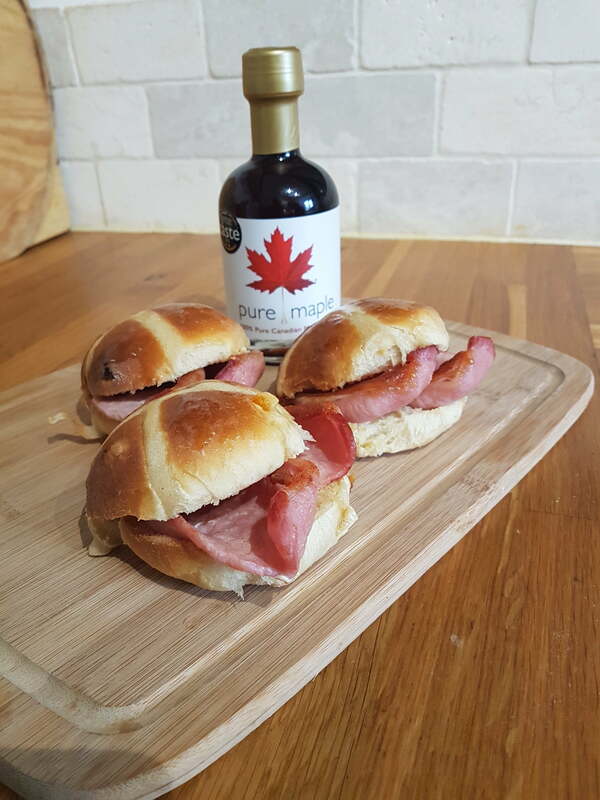 They are lovely to eat just out of the oven, hot with a dab of butter or for a real treat try serving them with a couple of pieces of back bacon placed in the middle of the bun or for a vegan option substitute try Quorn Deli Rashers. You get that gorgeous sweet and salty combination with a bit extra! Warm the milk on the hob and pour about 125ml of warm milk into a jug and leave to cool until it is lukewarm. Add the yeast and 3 tsp of sugar to a medium size bowl and whisk in the warm milk from the jug and leave it to sit in a warm place until the yeast froths up. To the remaining milk in the sauce pan stir in the butter and leave it to melt. In a large bowl weigh the flour and mix in the salt, make a well in the centre and then add the maple syrup, beaten egg, yeast and milk mixture and the cooled milk and butter. Using a mixer with a dough hook, mix everything up well until you have a sticky dough. Add a little bit of flour to the bowl to prevent the dough from sticking too much. Knead for about 5 minutes until the dough is smooth and elastic. Now add some vegetable oil to the bowl, using a spatula fold in the dough to lightly coat it and cover it with clingfilm. Put the bowl in a warm place and leave it to double in size for about an hour. Once the dough has doubled add the rest of the ingredients and knead again to evenly distribute all the fruit. Cover up again with clingfilm and leave to prove for 1hr or doubled in size. * At this stage the dough can be knocked back, covered up with clingfilm and placed in the fridge overnight. When taken out the following day, allow it to warm up before continuing to the next step. Tip the dough onto a lightly floured surface and fold it over repeatedly on itself until all the air is knocked out. Cut the dough into 15 evenly shaped pieces and roll them in your hands making a smooth ball. Place the buns on baking tray lined with parchment paper, leaving enough room between the buns for rising. Brush some oil on the clingfilm and cover them and allow up to an hour to rise or doubled in size. Heat the oven to 220C/200C fan. Mix the flour with about 5 tbsp of water to make a thick paste for the cross. Spoon it into a piping bag with a small nozzle and pipe the crosses on the buns. Starting from one end make a line along the length of the buns and repeat for the other columns then pipe across the rows to finish the crosses.